Andrew Parrott with a map of the area in his talk. 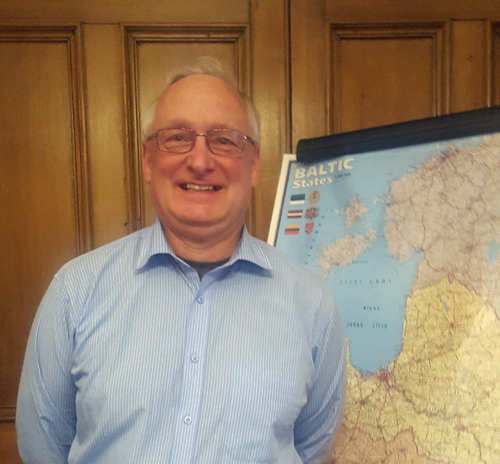 From childhood Andrew had been curious to know what had happened to the countries of Estonia, Latvia and Lithuania shown on pre-war maps. When an opportunity arose for a new posting towards the end of his 37-year career in the Army, he enquired about the possibility of becoming a defence attaché in Scandinavia or the Baltic states - and was delighted to be sent to the Baltic Defence College at Tartu, Estonia, for a four-year term from 1999 to 2003. This was a period of fascinating change - the city's two supermarkets were dwarfed by the arrival of ten larger ones. Those years also gave Andrew a new wife, and now they have a home in the Lithuanian capital of Vilnius which they visit three times a year, going on average every other year to Latvia and Estonia. After the dissolution of the Polish-Lithuanian Commonwealth in 1795, the area of the Baltic states was split between Prussia, which took the area around Memel, now Klaipeida, and Russia which gained the rest. The Duchy of Poland was created within the Russian Empire, which came late to railway-building, but in 1862 a main line was opened from the Tsarist capital St Petersburg to Warsaw with a branch from Vilnius to Konigsberg now Kaliningrad. These were not peaceful times, and following the Polish Revolution of 1830 there was another uprising in 1863. With a multiplicity of alternative place-names, the language of business was German or Polish, that of politics was Russian, while the locals spoke Lithuanian, Latvian or Estonian and there was a large Jewish population. The driver of rail development was the desire to open up Russia to the coast, with Tallinn becoming a major route to the sea, and the Latvian port of Liepaja became connected in 1873 with Minsk for the export of grain. Connections were gradually filled in to serve the interests of imperial Russia, which had nothing to do with local needs. There was always a change of gauge between Prussia and Russia, and because the Russians did not allow additional international connections the Germans took lines right up to the border. Supply railways of 750 mm were built in the north and south to connect the hinterland with the Russian-gauge main lines. After the outbreak of the Great War, the Russian armies were quickly forced into retreat by the Germans at the Battles of Tannenberg and the Masurian Lakes. By the end of 1915 a front line had been established along the line of the Daugava River and south from Daugavpils. In 1917 the Germans captured Riga and the Baltic islands. Trotsky's negotiating stance at Brest-Litovsk failed to impress the Germans who made huge territorial gains in the east at Russian expense in early 1918. But the Armistice which brought an end to conflict in the West was only the cue for things hotting up in the East, where at least seven factions including Bolsheviks, White Russians, Baltic Germans, Estonians, Latvians, Lithuanians and Poles fought for control of territory. Memel was annexed by Lithuania after a coup in 1923 but this sealed the fate of territory in the east, including Vilnius, which was now in the new Polish state. Military railways were built during the Great War by both sides. The Germans though were much more active building new standard gauge lines in captured territory, re-gauging captured lines and building a very extensive network of 600mm gauge lines to support the front line. After the war many of these lines were put to civilian use and some of them formed the basis for two extensive 600 mm gauge systems in Latvia. Other isolated forest railways continued in use for timber extraction. The first republics of the inter-war years have now existed for a shorter time than their modern successors. As now anxious eyes were cast eastwards and Balts still talk of security in the east only coming when they have borders with China! Kaunas became the Lithuanian capital, and the emphasis in rail development was on creating coherent national railway systems in each of the three Baltic states. Gauges proliferated. For standard gauge Estonia used the Russian standard, Lithuania used the European standard and Latvia had both. On the narrow gauge Latvia had mainly 600mm, Lithuania and Estonia had mainly 750 mm and Estonia even had 750mm gauge diesel railcars and sleeping cars. Riga built a line avoiding Lithuania to Liepaja, which at one time had no less than five gauges - 600, 750 and 1000 mm and both European and Russian standard gauge. In 1938 Lithuania was forced to cede Klaipeda to Germany which became Memel again. In 1939 Poland was divided between Germany and the Soviet Union and secret provisions of the Molotov-Ribbentrop agreement gave the Soviet Union a free hand in the Baltic States. While the Vilnius region was restored to Lithuania all three of the Baltic States were forced into accepting Red Army bases on their territory. The Finns successfully resisted the Soviet Union in the Winter War of 1939-40 but all of Estonia, Latvia and Lithuania were forcibly incorporated into the Soviet Union in 1940 (or occupied by it as they afterwards preferred to say), The Soviet Union set about destroying the institutions of the Baltic States and some forty thousand people were deported from Lithuania to Siberia (and similar numbers from Latvia and Estonia) in the week before the 1941 German invasion. The German advance in 1941 was rapid with German forces quickly overrunning the Baltic States and reaching the outskirts of Leningrad without much heavy fighting and damage. In complete contrast the Red Army's advance in 1944 was bitterly contested by the Germans with heavy fighting and very considerable damage to towns and transport infrastructure. When the Russians captured Memel in January 1945 just eight survivors were found in the ruins, the rest of the population having been evacuated to Germany. Many railways fought over in World War Two were never restored including all of the minor railways in the Memelland. During the war the Germans did re-gauge many lines and did a little railway construction including a new connection on the coast between the Latvian and Estonian 750mm gauge systems. After the war the Soviet Union faced much Baltic partisan resistance, notably in Lithuania, but set about building new lines to serve newly established industrial sites and military bases. There was some suburban electrification in all three capital cities, but nearly all the narrow-gauge lines were closed through the 1960s and 1970s, although some mainly in Estonia and Lithuania were converted to Russian standard gauge. Today just one narrow gauge line in Latvia between Gulbene and Aluksne retains a daily passenger service but it is primarily for tourists. The Soviets were good at new construction but much less good at maintenance, so the legacy of Soviet occupation in all three Baltic states was dilapidated railway infrastructure and elderly rolling stock. Lithuania declared independence in 1990 and guarded their parliament against siege for a year and there were casualties in massacres at the Vilnius TV tower and at the Medininkiai frontier post, Only in Estonia was Independence achieved in 1991 without spilling blood where the Soviet commander, the Chechen Djokar Dudayev, gained respect by making it clear that he would not order Soviet troops to open fire. A fundamental modernisation of the railway networks has followed independence. In Estonia, much freight traffic has been lost but most of the railway network has been retained and is now a very modern passenger focussed system using Swiss Stadler stock. In Latvia there has been a considerable contraction of the network although much heavy freight traffic has been retained, Passenger services concentrate very much on the Riga suburban network, with a few longer distance survivors, using mainly refurbished ex-Soviet stock still. In Lithuania there was a real Beeching experience in 2001 but on the remaining network there is much heavy freight hauled by modern diesel locomotives and the passenger services are now very largely in the hands of modern mainly Polish Pesa rolling stock. In Estonia in the last fifteen years every single station has been rebuilt for use with the new orange liveried passenger stock, referred to as carrots by many local people, and many of the smaller stations have platforms one carriage long where selective door opening is used. Narva station, on the frontier with Russia and still being rebuilt, sees Estonia's only remaining international service, the daily train to St Petersburg which continues to Moscow as a sleeper service. In Tallinn now all public transport on trains, buses and trams is free for residents and there is an aspiration in Estonia to extend free public transport across the whole country in the future. It is still possible to travel by train between Tallinn and Riga. Estonian trains serve Valga the border town shared with Latvia and Latvian trains serve Valka, the Latvian name for the town, but use the Estonian station. Connections though are not good and any through travel presently entails a long wait at Valga station. In Latvia there is still much heavy transit freight to and from the Baltic Sea ports and electrification of key routes is proposed. There has not been so much investment in passenger services though. Much refurbished ex-Soviet stock is still in evidence and away from the Riga suburban network passenger services are sparse. There is for example just one train a week between Liepaja and Riga to serve weekly commuters to the capital. A daily sleeper train still runs with carriages to St. Petersburg and Moscow and there is an every other day sleeper service to Minsk. A new and welcome development is the weekly "Four Capitals" service run by Ukrainian Railways between Riga and Kyiv via Vilnius and Minsk. Things are more positive in Lithuania although some routes have been lost. The old trunk route from St Petersburg to Warsaw now terminates at Marcinkonys a village in the forests of south eastern Lithuania and is served by a modern diesel railcar from Vilnius three times a day. Today the new route to Warsaw bypasses Belarus and the new European standard gauge link between Kaunas and Poland, part of the Rail Baltica project has recently opened. Modern diesel locomotives haul very heavy freight trains on vastly improved infrastructure to Klaipeda and all passenger services are in the hands of modern, mainly Polish Pesa multiple units and railcars. The double-deck emus that operate the service between Vilnius and Kaunas are very spacious and comfortable taking advantage of the huge loading gauge. From Vilnius there a several trains a day to Minsk and a new weekends only service to Daugavpils in Latvia has recently started. Vilnius also sees three or four transit trains every day linking the Kaliningrad enclave with the rest of Russia. Another positive sign is the re-introduction of a five times a day service between Silute and Klaipeda that last saw passenger traffic in 2011. The EU-funded Rail Baltica project is about political integration, and has already achieved a weekend service linking Poland with Lithuania. The website reveals that in recent days the joint venture of the three Baltic states RB Rail AS has "commenced the development of the architectural, landscaping and visual identity guidelines for the railway infrastructure elements ... has met with representatives from Crossrail and HS2 to learn more about their experiences of implementing BIM systems ... and is progressing with a study which assesses the climate change impact on its design, construction, maintenance and operations". However Vilnius has been left off the proposed direct line, and the Estonians are anxious about the threat posed by construction to their precious forests. With very low populations concentrated around the three capitals and a flat landscape that facilitates road mobility, the reality is that any new network would require massive subsidy for an uncertain level of service - contrast the weekly train linking Vilnius and Riga with the coach that runs very frequently on the dual carriageway that covers most of the route between these two capitals. Narrow gauge heritage operations in Lithuania have received much external advice but seem bogged down in bureaucracy and in Estonia the narrow gauge museum tries hard. In this area Latvia is very much the market leader with the line from Gulbene to Aluksne. There are no standard gauge heritage operations but there are interesting museums at Vilnius station, in Riga with an outstation at Jelgava and at Haapsalu in Estonia.